Rescuers work in the hull of the upright ship Eastern Star in an effort to search for the missing in the section of Jianli on the Yangtze River, central China's Hubei Province, June 6, 2015. The death toll from the sinking climbed to 406. 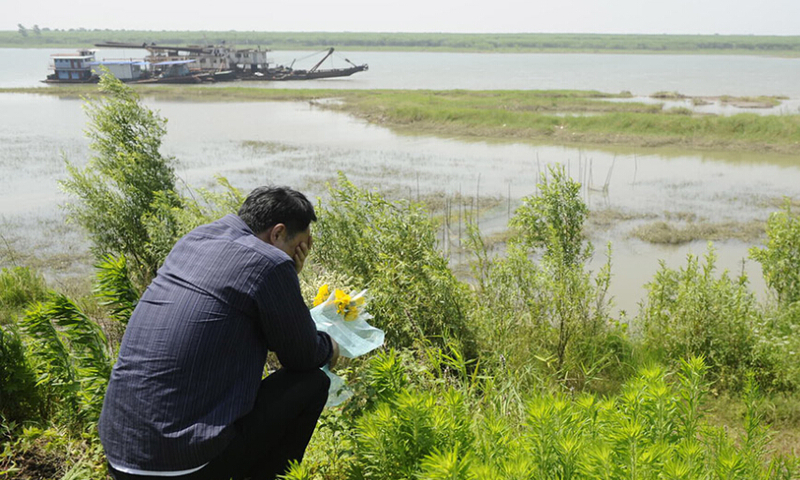 A mourning ceremony is held for 406 deceased people on the capsized ship Eastern Star at the sinking site in the Jianli section of the Yangtze River, central China's Hubei Province, June 7, 2015. Mourners from Nanjing, Jiangsu Province, gather on the Yangtze River in Jianli, Hubei Province to honor relatives who perished on sunken Eastern Star on June 6, 2015. 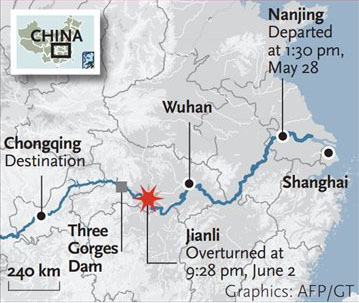 The death toll from the sinking of a Chinese cruise ship on the Yangtze River during freak weather climbed to 406 on June 7, with some 40 still unaccounted for. Rescuers extended their search scope to some 1,300 kilometers along the Yangtze River with hopes to find over 40 people who are still unaccounted for after a Chinese passenger ship capsized. In a sign of mourning to Eastern Star victims, China's state and other major TV channels announced to suspend entertainment programs from June 6 to 8. The Ministry of Transport (MOT) said that oil leaking from the capsized Eastern Star in the Yangtze River has been cleaned up. The death toll from a Chinese cruise ship that capsized on the Yangtze River during freak weather has climbed to 396 as of noon. The death toll from a Chinese cruise ship that capsized on the Yangtze River has climbed to 331 as of 8 am Saturday, local authorities said. Another 14 people survived the accident. Search and recovery efforts at wrecked Eastern Star ferry began at 9:22 pm and are expected to take seven hours, said an official at a press conference held on June 5, CCTV reported. The cruise ship is being hoisted from the river after rescuers righted it on Friday morning, said Xinhua. Up to 10:20 am, a total of 97 people were found dead, Modern Express reported. The search and rescue team has righted the capsized cruise ship, CCTV reported. Rescue workers began to right the capsized ship, CCTV reported. Up to 3:12 am, a total of 82 people were found dead, CCTV reported. 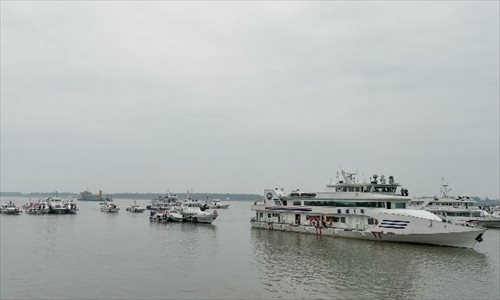 The search and rescue team started to right the capsized cruise ship on the Yangtze River at 8 pm on June 4, according to the Ministry of Transport (MOT). Up to 3 pm, a total of 75 people were found dead, CCTV reported. The ferry is no longer in danger of sinking thanks to the emergency crews. 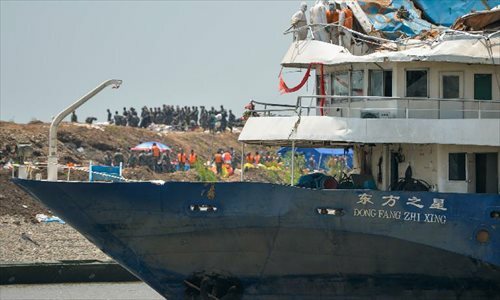 The rescue teams are now simultaneously searching for suvivors and righting the overturned ship, said Lin Han, director of the Underwater Inspection Center, Wuhan Changjiang Waterway Rescue and Salvage Bureau. Rescue work continues on June 4 morning. From 9 pm June 3 to 8:30 am June 4, 40 people were found dead. Up to 8:30 am, a total of 14 people were rescued and 66 found dead. A total 425 people remain missing since the ship went down 40 hours ago. Up to 11 am, a total 14 people were rescued and 18 found dead, CCTV reported. Three more people have been taken onshore after rescuers cut open part of the capsized ship. China has dispatched a 140-member frogman team and five helicopters to help in search and rescue. The Air Force has dispatched six planes to aid in rescue efforts, according to the Ministry of National Defense of China. An 65-year-old woman was rescued , Xinhua News Agency reported. A man in his 60s was rescued, reported CCTV. Hubei meteorological authorities said that a 9.2-grade wind battered the ship between 9 and 10 pm on June 1, reported Chutian Metropolis Daily. The ship’s oldest passenger was 83 years old and the youngest was 3, according to the released passenger list, The Oriental Guardian reported. 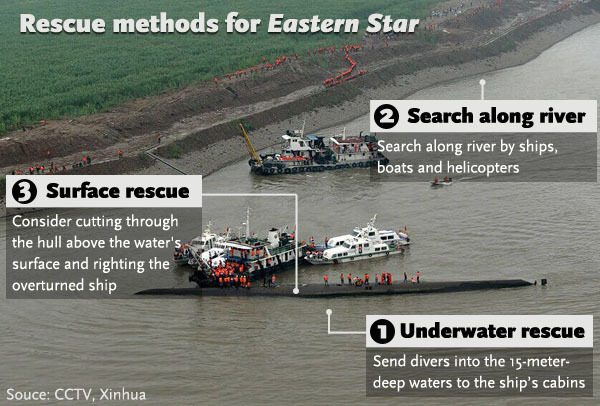 “A total 12 people were rescued and five found dead,” local newspaper Hubei Daily reported. The passenger list has been submitted to officials in Shanghai and Jiangsu Province, said a spokesman for the Shanghai Xiehe Travel Agency. Public security officials said that the ship's captain and chief engineer have been detained by the Yangtze River Navigation Public Security Bureau, sina.com reported. “We’ve past the ‘four golden hours’ for rescue. Follow-up relief work will be very hard,” a spokesman for the navigation department was quoted as saying, sina.com reported. The Jianli People’s Hospital said that there are treating three survivors. They are currently in stable condition, CCTV reported. Rescuers struggle in the wide section of river as heavy rains continue in the area, CCTV reported. Though more than 30 boats have been dispatched in the rescue efforts, rescuers are still in need of a high powered salvage ship to pull up the large sunken ferry. A salvage platform has been set up and divers are at the scene. Rescuers report hearing responses from people still trapped in the overturned vessel through the hull bottom, CCTV reported. Thirteen people have been located so far, 12 of which have been rescued, reported CCTV. Rains and terrain continue to impede rescue efforts, reported CCTV. A body of a tour guide has been recovered, CCTV reported. 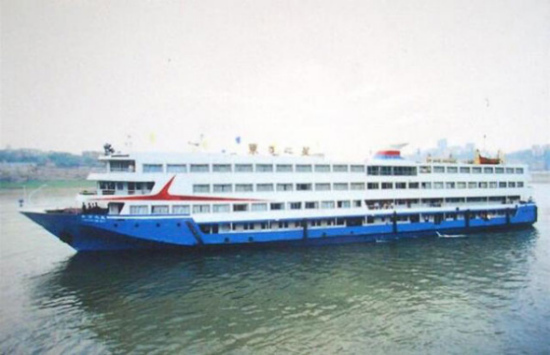 According to the Yangtze River Navigation Administration, The “East Star” luxury cruise ship sank within two minutes after being caught in a cyclone, leaving no time for the boat to send a distress signal. Most of the passengers are elderly, many of which were readying for sleep when the boat sank. The China Maritime Search and Rescue Center located the site where the ship sank, Xinhua reported. Currently part of the overturned ship is above the water’s surface. The ship has completely sunk below the Yangtze River. Chinese President Xi Jinping and Premier Li Keqiang are directing emergency rescue efforts, Xinhua reported. Cause: The ferry’s captain and chief engineer, who have been rescued, both claim the ship sank after being caught in a storm. ●Most of those aboard were between 50 and 80 years old. Until June 7, 12 people were rescued and 431 found dead. Chinese President Xi Jinping has called for an all-out rescue effort. Premier Li Keqiang is heading to Hubei Province to direct rescue efforts.